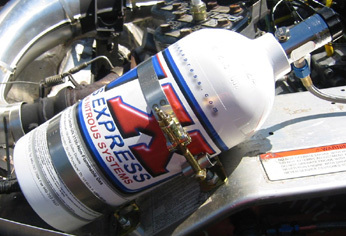 New Nitrous Oxide Systems for snowmobiles and ATV's. The most common complaint about nitrous oxide use is the inconsistency in performance resulting from changes in nitrous oxide pressure. These pressure changes result from bottle temperature changes, and in the temperatures encountered on a snowmobile can cause a change in nitrous oxide delivery rate of over 100%. This drastic change in nitrous delivery can result in a major inconsistency in power or engine damage or both. 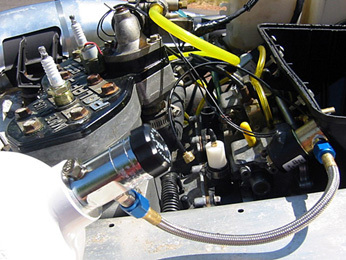 Holtzman has developed a new patent pending nitrous nozzle which automatically adjusts in response to nitrous oxide pressure to maintain essentially constant nitrous delivery over a pressure range of 300 PSI to over 900 PSI. This corresponds to a bottle temperature range of 0F (-18C) to +90F (+32C). 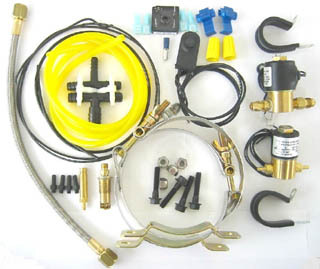 We have a kit which delivers a 30 horsepower boost which is designed for snowmobile applications having a single air box and a pulse fuel pump. We are currently developing kits for machines having carb or throttle body filters and pulse fuel pump (PCT30F2-PP) and machines having fuel injection.